BabyBjorn Mini Cotton Bouncer, Gray/Jersey by BabyBjörn at My Pregnancy Place. MPN: 001082US. Hurry! Limited time offer. Offer valid only while supplies last. Mini is here. Please welcome Bouncer Mini - a bouncer that understands newborns and young babies. Mini likes playtime and is good for taking naps. Mini is here. Please welcome Bouncer Mini - a bouncer that understands newborns and young babies. Mini likes playtime and is good for taking naps. Mini loves to comfort and make little babies happy. Bouncer Mini is a reassuringly safe place to lay your newborn. It provides invaluable help in the early days at home, helping to cradle your baby for you. Unlike most bouncers, Bouncer Mini is powered by babies - no batteries required. Bouncing is great fun and a natural way for your baby to learn to soothe themselves and to train motor skills and balance. 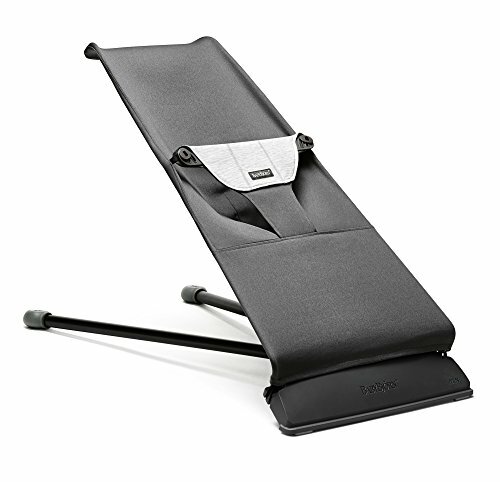 The Bouncer Mini has two positions that are perfect for both playing and resting, and it is easy to switch between positions. In both positions, the Bouncer Mini provides proper and comfortable neck and back support, which is essential for newborns whose muscles are not yet fully developed. You naturally want your baby with you all the time, so Bouncer Mini is easy and convenient to move around your home so you can always keep baby close. The easily removable and washable fabrics on the Bouncer Mini are a parent's best friend, as dribble, spit-up and diaper leaks are only to be expected in the early days. The Bouncer Mini can be used from newborn and up to 6 months.